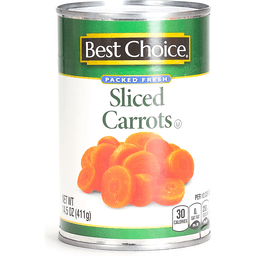 Made with Fresh Cut Sliced Carrots. Quality. With natural sea salt. Guaranteed. Picked fresh. Packed fresh. No preservatives. Packed from fresh carrots. 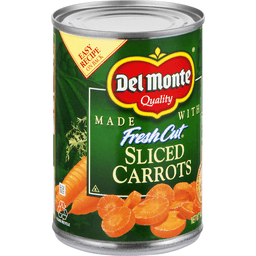 Del Monte Sliced Carrots are the highest standard in freshness and flavor because they are packed from fresh carrots. Picked fresh. Packed fresh. Unsurpassed quality you can taste in every bite. That's the Del Monte guarantee! Visit us at: www.delmonte.com. Questions or comments? Call 1-800-543-3090 (Mon.-Fri.). Please provide code information from the end of can when calling or writing. Please recycle. Product of USA. Vitamin A rich. Flavor you won't believe came from a can! 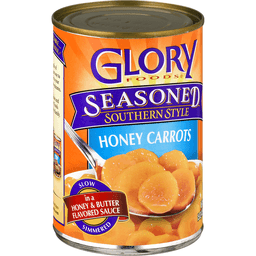 For more easy Southern recipes log on to: www.gloryfoods.com. Glorious quality. Our healthy, delicious Honey Carrots are seasoned with the finest ingredients for unmatched Southern flavor. Glory Foods stands for old-fashioned Southern quality. No MSG added. 0 grams trans fat per serving. Good source of vitamin A. Good source of beta-carotene. Naturally gluten-free. Your questions and comments are important to us. 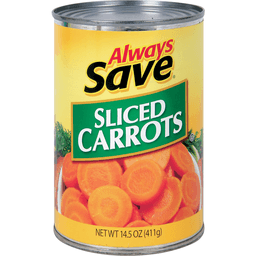 Please call 1-800-277-2012 and include the code found on the lid of the can. USA fresh. 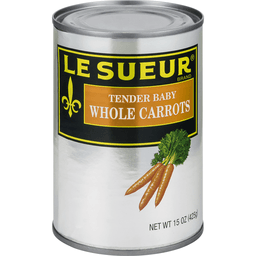 Le Sueur® Tender Baby Whole Carrots. Per 1/2 cup serving: 30 Calories. 0g Sat fat, 0% DV. 360mg Sodium, 15% DV. 5g Sugars. Net Wt 15 oz (425 g). For over 100 years, we've been cultivating vegetables in the richest and most fertile soil we can find. Our passion and pride for what we grow has made the Le Sueur® name synonymous with unsurpassed quality and flavor. Taste for yourself why so many have come to love and trust LeSueur. A gluten free food. Questions or Comments 1-800-998-9996 Mon-Fri 7:30 a.m. - 5:30 p.m. CT (Please refer to code numbers on lid and bottom). © 2013 General Mills. 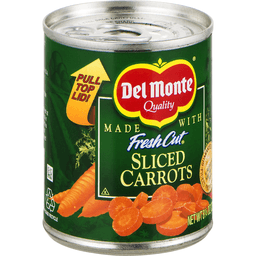 Del Monte® Fresh Cut® Sliced Carrots. With natural sea salt. No preservatives. Net Wt 8.25 oz (234 g). Del Monte® Sliced Carrots are picked fresh at the peak of flavor, then packed fresh to lock in their sunny-sweet taste and nutrients. With no artificial flavors or preservatives, you get unsurpassed Del Monte® flavor-Guaranteed! Non GMO‡. ‡Ingredients of the types used in this product are not genetically modified. Please recycle. Please provide code information from the end of can when calling or writing. Questions or Comments Call 1-800-543-3090 (Mon.-Fri.). Visit us at: www.delmonte.com. © Del Monte Foods.